These kids chores seasonally are organized by age group. Keep in mind, however, that these age groupings are recommendations - and just that. 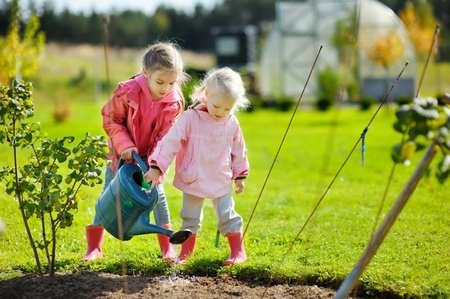 Kids age 3 and older can help with seasonal chores such as watering plants. Your child may be capable of doing a chore sooner or later, depending on her level of concentration, fine-motor skills, or maturity. Getting kids to help with cleaning isn't easy, especially in the beginning. Besides, how much help can you realistically expect from a child? The answer depends on the child's age. However, you'll want to be there the first time your child tackles a new task, regardless of age. Beginners need pointers for even the simplest jobs. What's second nature to us is a new experience for them. These kids chores seasonally by age can help get you started. Debug plants with gardening games. Sponge-clean the outdoor play table. Take indoor plants outside for a gentle washing. Clean the patio and patio furniture. Plant vegetables, annual and bulbs. Clean out the fireplace and clean the tools.